Lakers versus Celtics and the NBA Playoffs was announced by Electronic Arts, though it is unknown how far into development it was. The August 1991 issue of Gamepro states it was to be released shortly after the release of the Super Nintendo, and showed an obviously in development screenshot of the game. The Genesis version of the game came out in 1991, and the screenshot here is much different than that version. 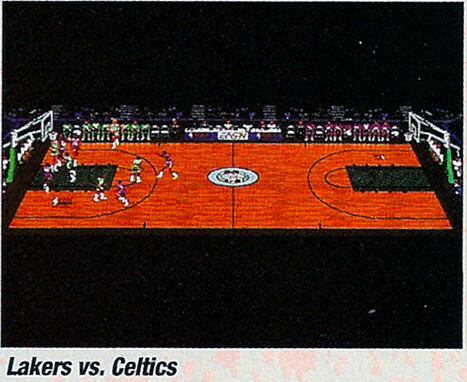 The screenshot shows a panned out view of the game, perhaps implying that it would show the whole court on one screen. It also shows the "EASN" logo, which is also not in the Genesis version. This game was delayed to become Bulls vs. Lakers, which was also unreleased. Description in the August 1991 issue of Gamepro. Scan courtesy of Retromags.